We meet you at Bangkok airport and transfer you to your hotel. The rest of the day is free for you to settle in and relax. Early this morning we make the 5-hour drive to Si Nakharin reservoir, stopping at Kanchanaburi en-route. Kanchanaburi is a small town made famous as the site of the bridge on the River Kwai. Here you're free to visit the famous bridge over the River Kwai along with World War II cemeteries and the local War Museum. From here we continue on to the reservoir, arriving early afternoon. Accommodation at the reservoir is in a comfortable floating teakwood house. The next 3 days are dedicated to fishing for the elusive snakehead. This powerful predator is renowned for being a challenging fish to catch and we use high powered speedboat to easily and quickly get to and from the best fishing spots. Si Nakharin is around 100 km long and offers excellent lure fishing for all snakehead species and jungle perch, as well as bottom fishing for various Thai fish species of interest. 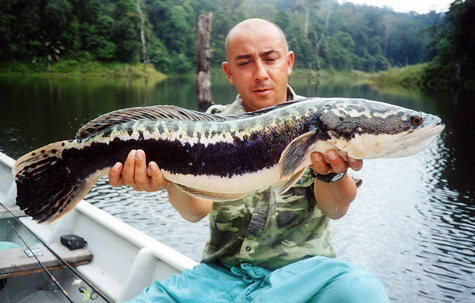 The reservoir’s Giant Snakehead (Channa micropeltes) population is big, and numerous catches by our clients have been well over the 5 kg mark, the biggest catches being weighted on certified scales at 6.00 kg. At the end of each day you can relax in your comfortable floating house, eating traditional Thai food, drinking cool beers and watching the sun go down over serene jungle views. This morning you'll get a chance for a final half day snakehead fishing, before we transfer back to Bangkok by road. Today is completely free for you to recover from your week of fishing and to enjoy some last minute shopping or some more sightseeing, before we transfer you back to airport for flight home. We use a range of carefully selected hotels for our private departures. If you have specific requests for hotels, please ask for a tailor-made tour.